Remember how you guys voted on those leggings with pockets we designed? And how much we loved you for weighing in and helping us make that super hard decision? Well, the results are in … and the sale IS ON from today until April 25. Here is your winner: Geo Ombré! Besides the amazingness of having a pocket on your leggings (that’ll fit your phone and your keys — life changing! ), these leggings from Four Athletics are the same quality you’d get from a pair from one of the Big Name Leggings Brands (you know the ones), except they’re $20 less expensive than any of those big stores. Good question. Because these are crowdsourced and made on demand in the U.S., there’s absolutely zero waste. Not only does this make the world a more sustainable place, but it keeps prices down for you. Woot! And, seriously, these are so cute on. 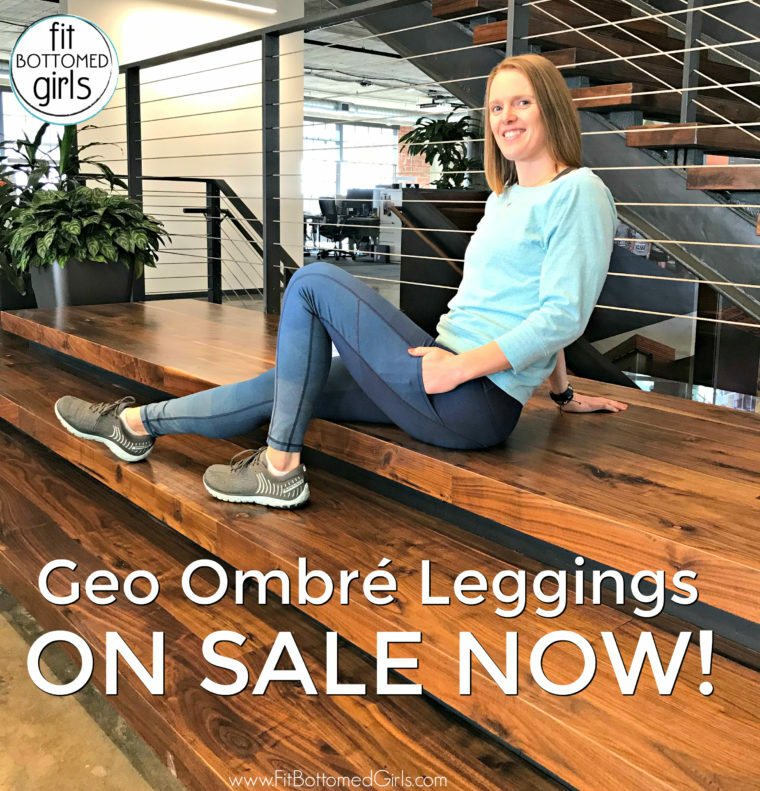 They’ve got a high waist for a flattering, supportive fit, and they’re printed on a soft, breathable fabric that feels like a second skin — but has no sheer shenanigans going on no matter how low you get in that squat. Did we mention they’re also designed so that the color fades from dark up top to light as it moves down your leg? Yep, because nobody wants her crotch sweat to show. Note the side pockets … they’re everything! Right now these are available in sizes 2-12, but for those of you looking for something a little larger, know that we are thinking and planning ahead for you with Four Athletics. If there’s enough demand for Geo Ombré now, we’ll be able to expand this look and/or new looks to more sizes. Fit bottoms come in all shapes and sizes so this is a priority and goal for us. Cute leggings for all! Alrighty, we are so excited about this and thank you so much for your continued support. What questions do you guys have about these? What else do you want to know? Need to know? Let us know in the comments! whoot! Just ordered mine as a reward for currently crushing my Ragnar training goals (including going for a run in the miserable, driving rain when I really just wanted to stay home).